We hope you will enjoy our original patterns by Margaret Carlson, mainly American landmarks and history, designed in the heyday of cross-stitch in the 70's and 80's. These are her original hand drawn charts painstakingly remastered into easy to read, color, digital charts. 8.4" x 5.7" stitched on 14 count. 6.5" x 4.4" stitched on 18 count. 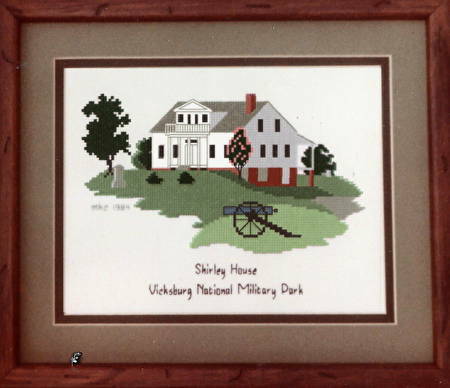 Shirley House Vicksburg cross stitch pattern... The Shirley House was owned by James and Adeline Shirley and is the only wartime structure remaining inside Vicksburg National Military Park.